I am going on the record as saying the Burpee Mile is more difficult than any marathon I’ve ever run. And it took me almost as much time to “run” one mile as it takes me to run 26.2 miles. 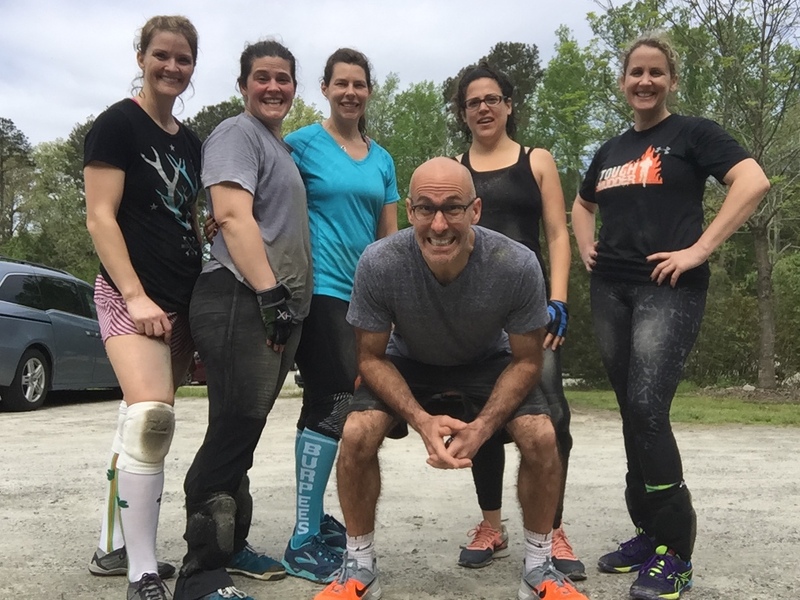 ‘Twas Sarah Dodge’s idea to attempt the Burpee Mile, and she’s now my least favorite Dodge. What’s the burpee mile? From a standing position, place hands beside feet and jump feet to plank. Ensure that chest and thighs touch the ground, jump feet to hands, and then complete a broad jump. Do this for 5,280 feet. I wore my “Every Dog has his Workout of the Day” CrossFit Surmount tee shirt, lululemon shorts, sweatband skull cap, batting gloves, and Nike long socks with Nike Metcons. I had purchased volleyball knee pads but decided at the last moment not to wear them. Good call. I did loan them to Sarah Dodge. Did I mention that she’s my least favorite Dodge? I even like the Dodge Dart more than I like Sarah Dodge. 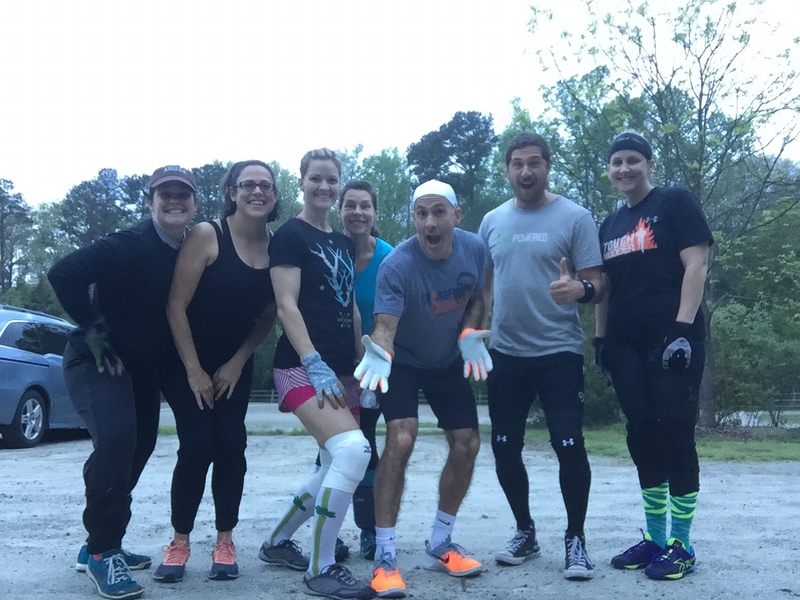 Carin, Courtney, Doza, Jaclyn, and Karina joined Sarah and me, and our adventure began at 7 am near the White Oak Church entrance of the American Tobacco Trail. ‘Twas already 65 degrees and somewhat humid. We completed the workout in quarter mile intervals, i.e., up and back a quarter mile two times. So that the start wouldn’t be crowded, Jaclyn, Doza, and I began first. I was certain that they’d stay by my side for at least the first quarter mile but I took and kept an early lead. I was somewhat surprised by how quickly I began to feel winded. I kept telling myself “Be a tortoise and not a hare. 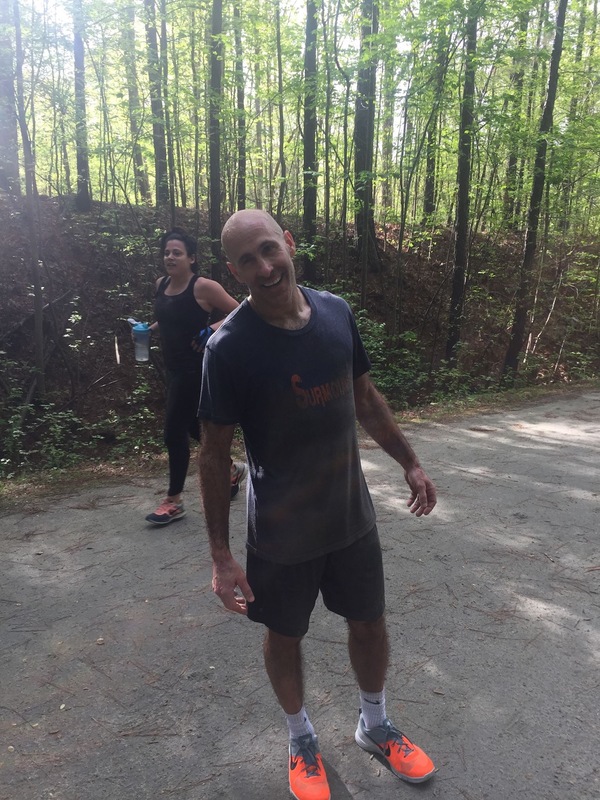 Slow and steady wins the race.” I completed the first quarter mile interval without stopping, although I occasionally glanced over my shoulder to make sure everyone was okay. I counted burpees for the second quarter mile interval. Whilst I did occasionally pause to shake out my arms and legs I kept a steady pace. I completed 235 burpees. I completed the first half mile in about 1 hour and 3 minutes. Gah! That’s a slow half mile! I had become exceedingly thirsty so I drank about 16 oz. of sfh Recovery and was on my way. My thirst wasn’t the least bit quenched. Mark Carter, the nice man that he is, paused while riding his bike to take snapshots of all of us. I was not only drenched by this time but was also covered in crushed gravel. I was ecstatic when I finally saw the turnaround. Just a quarter mile to go. I continued to complete burpees in reps of 5. I got my second (or possibly third or fourth or fifth) wind and was completing reps nonstop. I thought, “That’s 25, you can do 5 more. that’s 30, you can do 5 more. That’s 35, you can do 5 more. You can make it to 50.” I completed the 40th rep and, even though my mind was convinced I could keep going, my body stopped. It was quite a surreal experience. I eventually caught and passed Sarah and Carin. It become more and more challenging to complete reps, and I began completing just 5 at a time. Courtney had indeed placed a shaker bottle on the bench, but it wasn’t my shaker bottle. And I didn’t care. I took off the lid and took a long swallow. I noticed that what appeared to be direct protein was stuck to the bottom of the bottle. Or at least that’s what I thought it was. Karina let me know that she didn’t use the shaker bottle to mix protein and that it was likely a kibble stuck to the bottom of the bottle. A kibble, you know, dog food. I couldn’t recall how many burpees it took me to get from the bench to the finish my first go-around, but I had in my mind that it was 35. I completed 5 and thought, “Just 6 more sets of 5.” I completed another 5, and another and another. I’d look up after completing the broad jump and glance toward the finish. It was as if the finish line was moving farther away from me. Could it be that I was capable of altering time and space? Doza, who completed a burpee half mile, was at the finish and I asked him to record me crossing the finish line. 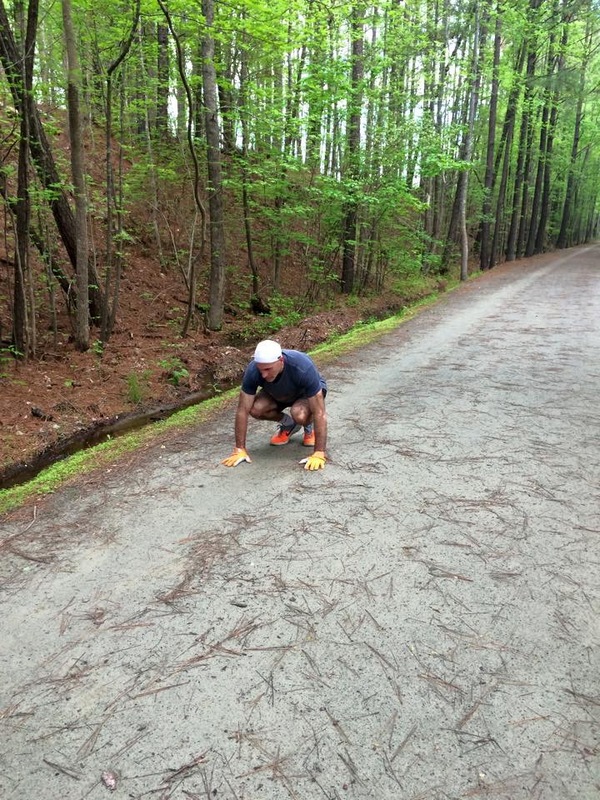 When I thought I was just 25 burpees away I determined that I wouldn’t rest until I crossed the finish line. Karina, who was completing a burpee half mile, was in front of me. I also determined that I would catch and pass her. She could hear me catching up with her so she picked up the pace. Dammit. I did pass her with just 2 burpees remaining. Yay for me! Dammit if you’re Karina. Uhm, it took me 50 burpees to finally cross the finish line. For one brief moment I thought I was going to puke. I did not. Whew. Close call. Yup, it took me that long to complete. There were quite a few folks running, walking, and biking on the ATT this morning, and many offered encouragement. Quite a few also wanted to carry on a conversation regarding what I was doing. Uhm, it’s a burpee mile. Uhm, I’m winded enough as it is and I’m not going to stop what I’m doing to explain it to you. Uhm, it’s not too difficult to figure out yourself. Three different people asked, “What are you training for?” Uhm, for life. I’m training for life. Jaclyn did indeed complete the entire mile! I know that the rest wanted to do so but ran out of time. I honestly didn’t think it would take so long to complete. Position hydration along the course, as going an hour without hydration leads to (you guessed it) dehydration. Complete on a 1-mile course, i.e., not in quarter mile intervals or an out and back. I incurred no injuries and, a mere 5 hours later, feel fine. The mile recovery walk with Luke, once again on the ATT, helped. And now some math. This could get ugly. As I’m 5’6.5″ on average I broad jumped my height. I did indeed complete each and every burpee as prescribed, even going so far as to glance at my feet to ensure that I landed where I took off. I also always jumped both feet back to plank. As I stated earlier, this was more difficult than i could’ve ever possibly imagined. Me, just after crossing the finish line.